Categories: Ski Chair Lift Furniture, Ski Chair Lift Swing. A Ski Chairlift Swing provides an interesting, functional seating solution and can be the perfect place to bond with intimate conversations. It’s also a fun place for kids to chill-out on those balmy summer days. Each unit is user-friendly for a D.I.Y. installation. All you’ll need is a solid place to mount your unit to but if you do not have you can order an additional mounting kit for this purpose. 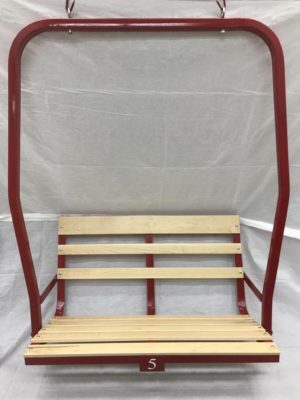 Finished to the highest safety standards, the Ski Chair Swing provides is fitted with new swing springs which are welded to the top of each unit. Each ski chair swing is finished in a standard matte black finish on steel frame but additional color options are also available as optional upgrades, at a small fee. Fashioned from fine Maple Wood slats, hand milled in-house and solid steel frames, these swings receive absolute care in construction, getting finished to stringent safety standards with superb finishes that will satisfy the most discerning tastes. Finished in a standard black. For porch installations, it is best to do your homework if you are planning to suspend the ski lift chair from rafters. Check with your architect to find out what weight the beams on your veranda will support before fixing your Ski Chairlift there. 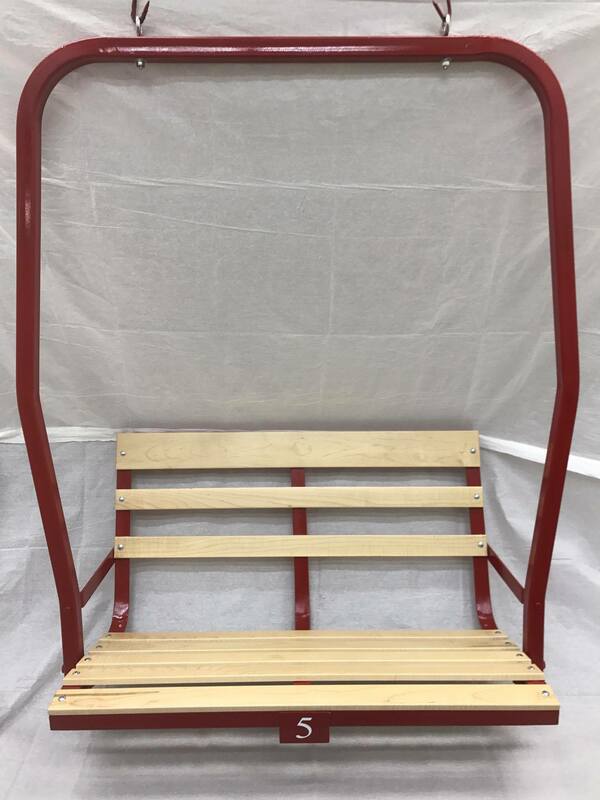 If you do not have a sturdy place to mount the chair to please check out our ski lift bench version. Order your Ski Chairlift Swing today! Email your enquiry now for a prompt quote on your custom-made unit. Shipping details supplied with quote.